The primary focus of this update is transplant volumes. Before getting into that, we need to address the volume of evidence about the killing of prisoners of conscience, primarily Falun Gong, for their organs. Many claims of human rights abuses suffer from having too little evidence. With this claim of transplant abuse in China, the volume problem is the opposite – too much evidence. There are now three books on the issue, our two and State Organs, a collection of essays which David Matas edited with Torsten Trey, published in 2012. There is an NGO dedicated to combating the abuse – Doctors Against Forced Organ Harvesting (DAFOH). There is a website focused on the issue alone – endtransplantabuse.org. There have been five documentaries produced on the violation – Transmission 6‑10, Free China, Red Reign, Human Harvest, and Hard to Believe. About the killing of Falun Gong for their organs, there is more than just a collection of evidence; there is a field of knowledge. In a world of thirty‑second soundbites and 140‑character messages, the volume of evidence is a problem. The gravity of the abuse would be a lot easier to communicate if less information were needed to show that it is happening. The number of people who have the patience to wade through all the information available on the killing of Falun Gong for their organs to come to their own conclusion is, unfortunately, comparatively small. One reason that the abuse has not received the global attention it deserves is the sheer volume of evidence that needs to be marshalled to show that the abuse exists. If we had one smoking gun or, as David Kilgour has put it, one smoking scalpel, which we could brandish to show that the abuse exists, our efforts to combat the abuse would be comparatively easy. When we have volumes of evidence that have to be considered as a whole to conclude that the abuse exists, then our audience for the abuse is regrettably but also necessarily diminished. It may seem counterintuitive in this context to add to this problem by presenting for consideration yet more evidence. What this update addresses is not more of the same – more data in fields already explored. Rather, it explores a whole new data field – the data from individual hospitals. We had in the past looked at particular hospitals to point out that their websites were promoting transplant tourism. Here, we look to them for transplant volumes. Reliable transplant volume aggregates in China do not exist. The Chinese health system runs four transplant registries, one each for liver, kidney, heart and lung. Public access to the aggregate data for these four registries, which does not now exist, would be useful, if for no other reason than to cross check the proliferation of contradictory statements Chinese officials make about transplant volumes. Yet, any registry is only as reliable as the reports it receives. These registries accumulate their data from reporting hospitals. We cannot assume that every hospital reports all of its transplants to these four registries. Considering transplant volumes, hospital by hospital, doctor by doctor is, in China, a mammoth task. There are almost nine hundred hospitals and between nine and ten thousand medical personnel engaged in transplants. 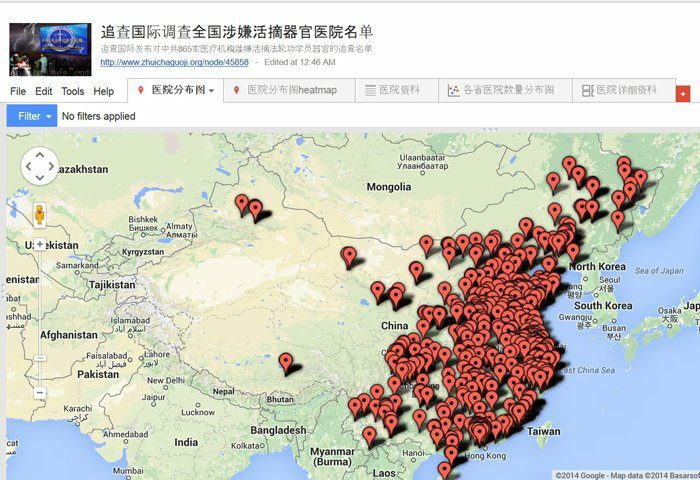 Moreover, cover up is not just in China an aggregate, national phenomenon. It exists as well at the doctor and hospital level. Nonetheless, to get a grip on transplant volume figures, it is a task which must be undertaken and we do so in this update. We do this not just to attempt to make more convincing the point we have made before. If you have gone through everything we have written up to now and are not already convinced that innocents in China are being killed for their organs, more data will not convince you. We make the additional effort to make an additional point – that the number of innocents killed for their organs in China is far larger than we had contemplated. The numbers stagger the imagination. When we look at hospitals and doctors one by one, a number of features jump out. One is the sheer volume of transplants. The total number of transplants which officials ascribe to the country as a whole, ten thousand a year, is easily surpassed by just a few hospitals. Whatever the total number is, it must be substantially more, by a multiple, than the official figure. This report focuses on the 164 hospitals which received approval from the Ministry of Health in 2007, so that we can categorize their qualifications as either national or regional level. If we exclude the 18 heart and lung transplant centres, 146 transplant centres remain. These include 23 national-level military and armed police hospitals that were among the first batch approved in 2007, 58 national-level civilian hospitals, and 65 designated hospitals. Among the 566 kidney and/or liver transplant centres which did not receive approval from the Ministry of Health, 405 were based in large-scale 3A hospitals. These included 56 military and armed police organ transplant centres, 349 mostly-3A civilian hospitals, and 161 medium-sized hospitals (including 55 Class 3 Grade C hospitals and 106 mostly-Class 2 hospitals). In the next section, we set out examples of different types of transplant centres, showing their qualifications, characteristics, transplant volume and capacity, and rates of growth. These examples give us an indication of overall transplant volume.